How do I apply my Premium Window Projection Material? AtmosFX Premium Window Projection Material is perfect for customizing your display to create a seamless illusion in different sizes or shapes of windows. The material can be cut to fit perfectly and then stays in place using static cling, so there’s no messy adhesive or hanging hardware to deal with. 2018 Premium Window Projection Material is sold in 3 foot by 8 foot rolls, but if your window is larger you can easily combine multiple rolls. You can also leave the material up year-round to give your windows an elegant, frosted look. For the best results, here are a few important steps you’ll need to follow when hanging Premium Window Projection Material. You may want some help holding the material up to make sure it is applied just right. There’re many types of curved windows out there, and some types are easier than others when cutting and installing your material. For example, you may have a full-size arched window, or a smaller window like a porthole or fanlight. If the window is one continuous piece of glass, cutting and installing Premium Window Projection Material is easy. If you have a curved window with lots of intricate panes it may take more effort to cut and install the individual pieces, but the results can be stunning. In our example, we’re demonstrating how to decorate in a continuous, arched window. You can also use this technique for measuring and drawing curves on any window with a perfectly circular edge. With a little creativity and effort, you can also adapt this technique for decorating other shaped windows as well. Note: Many windows may have slight variance between their bottom and top widths, potentially a difference of around 1/16th to 1/8th of an inch. While this doesn’t seem like much, you may need to make additional trims your material for a perfect fit. Once you’ve taken your measurements, you’re ready to start tracing the shape of your window onto your projection material. The saying “measure twice, cut once” is a good rule in this case. You want to be sure the lines you are drawing are clean and accurate before making any cuts. Begin by tracing a rectangular outline of your window using the height and width measurements. Once you have a perfect rectangular window shape, you’ll need to create a central pivot point for your compass, which you’ll use to trace the curved portion. First, measure the exact center along the top edge of the rectangle, and then make a small mark on that point. Make another mark directly below that point that is exactly the distance of your radius measurement. This second mark will be the central pivot point for your compass. Making precise curves can be tough without a compass and even if you have one, it may not be large enough. Luckily, you can make an easy DIY compass for large curves using two pencils and a piece of corrugated cardboard. 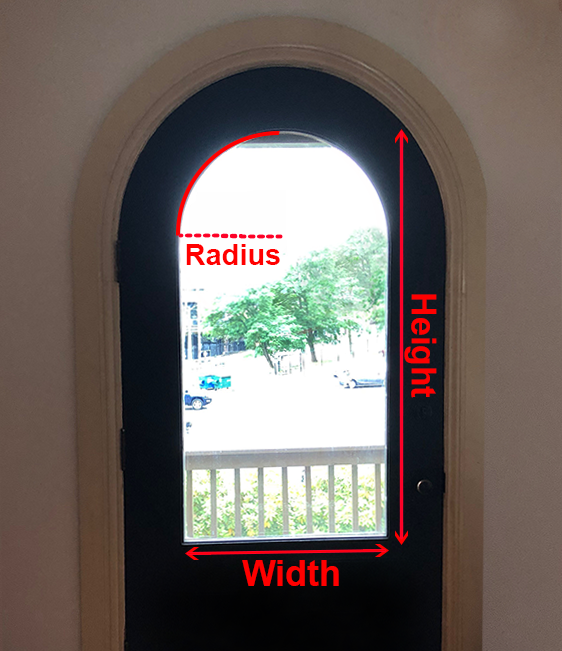 If you made your measurements correctly, the result should be shaped exactly like your window. Once you’ve finished drawing the shape of your window into your projection material, it will be time to cut it to size. Take this opportunity to re-check your measurements against your window just to be sure you haven’t made a mistake. You can always trim an edge later, but you can’t un-cut the material. You may use scissors or a utility knife to cut the material, but always use caution and proper supervision with sharp objects! When it’s time to remove your material, gently peel it off, roll it up with the matte side facing inward, and store it in a clean place. Your original shipping tube is a great way to store your material and keep it clean and crisp year after year.